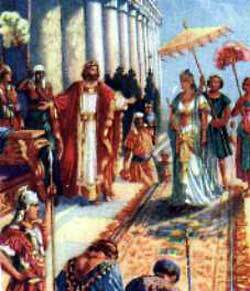 The Queen of Sheba is welcomed by Solomon. OLOMON HAD VAST treasures of gold and silver, and precious things of every kind. His people also were rich and happy. Solomon worshiped and served God faithfully; and God, as He had promised, blessed him greatly. When David had desired to build a house, or temple, for God's worship at Jerusalem, God had told him that his son Solomon should build it. So, when he came to the throne, Solomon built this temple of the richest materials, and in the most costly manner. Hewn stone, cedar, olive-tree wood, fine brass, pure gold, silver, and precious stones, were there in abundance; and artificers from Tyre, who were famous for their skill, wrought them for him. The Temple, which was placed on Mount Moriah, was seven years in building. When it was finished, Solomon dedicated it to God in a solemn assembly of the people; and the Lord God filled it with His glory, as He had done the Tabernacle in the wilderness. The wisdom of Solomon was celebrated not only among his own people, but in all parts of the East, whose kings sent messengers to him, that they might hear it for themselves. The Queen of Sheba came herself to Jerusalem, with a great train of people, and camels carrying gold, precious stones, and spices, as presents for the great king, that she might know, by conversing with Solomon, whether he was so wise as had been told her. And when she heard his wisdom, and had seen the splendor of his court and palace, she was so overpowered that she fainted. And she said to the king that before she came she did not believe what had been told her in her own land of his wisdom and greatness, but now she saw that not even the half of it had been made known to her. Happy were they who served before him, and continually heard his wisdom. And she gave thanks to God for having given such a king to his people Israel. Then, when Solomon had also given her costly presents, she and her train returned to their own country. But as Solomon grew older, instead of serving and worshiping God as he had done, he began to worship false gods. And then God, as He had threatened, let trouble come upon him and his kingdom, so that, after his death, ten of the tribes were taken away from his son, and set up into a separate kingdom, that of Israel, which was never again united to the kingdom of Judah.